They will design, plan and project manage the construction team and your entire build. Using our in-house expertise and experience we will understand your requirements and needs, then work with you to understand how to get the best out of your space and team through effective workplace optimisation. If you are moving into a new office or your just looking to re-design you’re current office, Building Interiors have the expertise to help. The office space planning team take your requirements into account by looking at the number of employees, teams and dynamics of your current office before creating a new office design. Listening to your brief, our team will create an office space that not only fits your current organisation but allows it to progress, taking into account future team growth and technology advancements. We are committed to helping you every step of the way, to ensure you are completely satisfied with your new space. 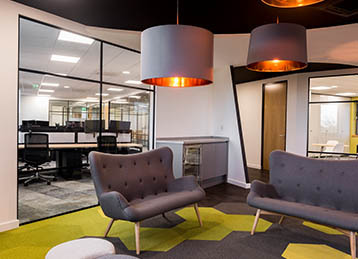 Our aim is to improve your business through your workspace, our specialist teams can provide the full solution, everything from planning, design and project management through to tear down, fit out, decorating and furnishings. Whether you are looking for an open office, office cubicles or areas where teams can collaborate easily, our team effectively plan the workspace around your organisation’s needs to ensure that your employees get the most out of their working environment. Effective formation also helps to optimise your workplace for maximum efficiency. 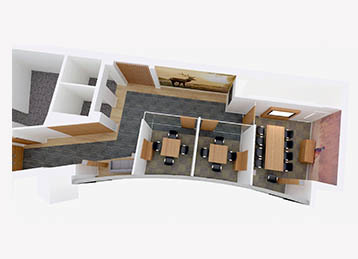 Your office may not require meeting rooms but if it does our team use office partitions to create bespoke offices and meeting rooms. From small internal meeting rooms to board rooms and creative brainstorming rooms, Building Interiors ensure your meeting spaces are thoroughly thought out to make the most of your office space. An office isn’t complete without supporting areas for the staff; this includes storage & filling spaces, bathrooms, waiting areas and kitchens. These areas are often over looked and their importance diminished but if you want a harmonious workforce, it is these areas they will appreciate the most. 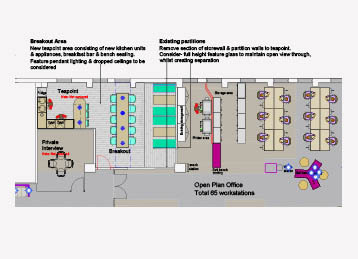 For more information on our office planning services or to get a free quotation get in touch with our experts today.